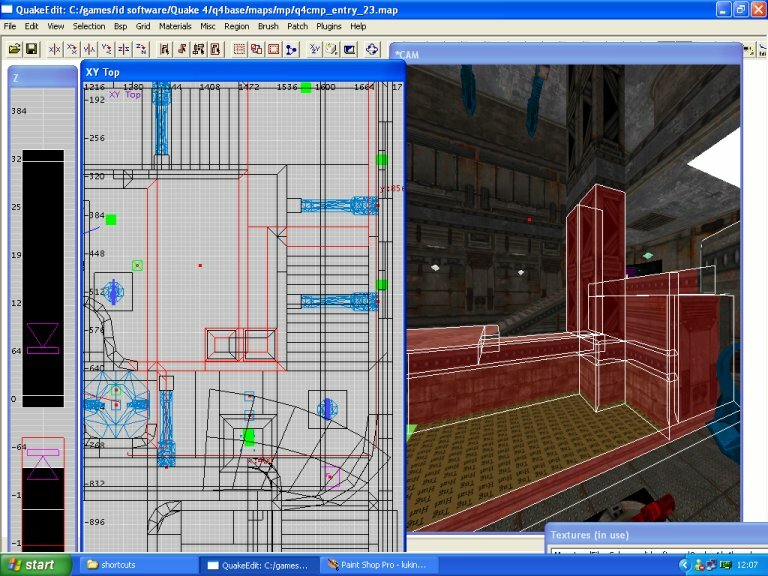 This article was inspired by the announcement of the idsoftware community map pack winners. Many of the chosen entries (of which mine were not included) demonstrated such poor construction technique I felt it necessary to draw attention to what seems to be a worrying trend. 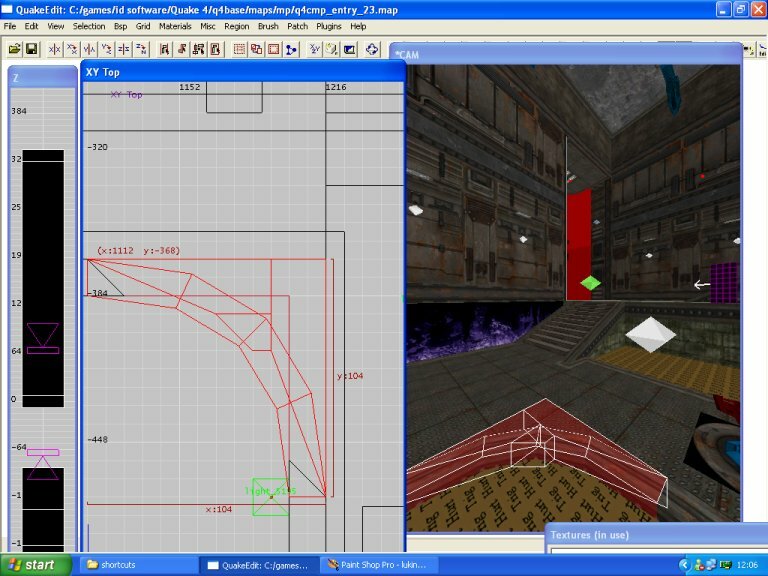 As a counter balance it should also be pointed out that several of the maps (noticeably those created by designers with experience in level building for Q2 and/or Q3 engine powered games) produced some solidly designed and constructed maps. What a wonderful tool dmap is. 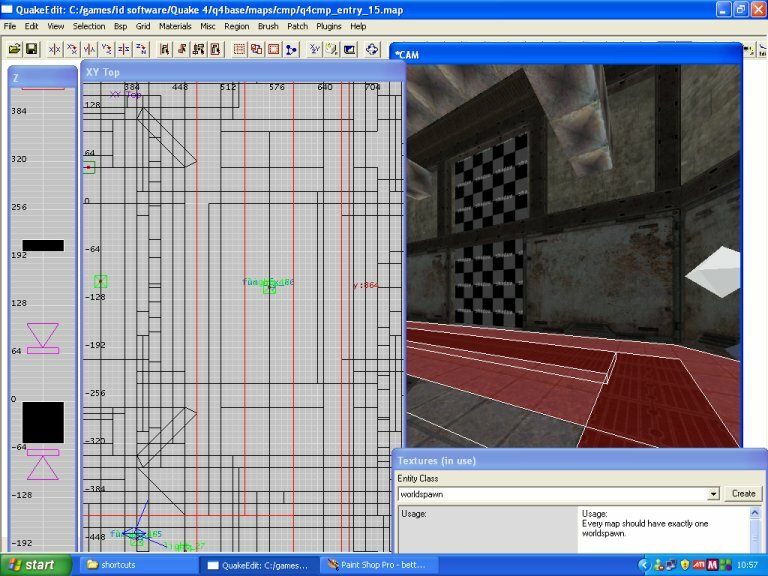 It is the compiling tool for Doom 3 and Quake 4 levels. This powerful application cleans up unseen geometry and optimises brush and patchwork. 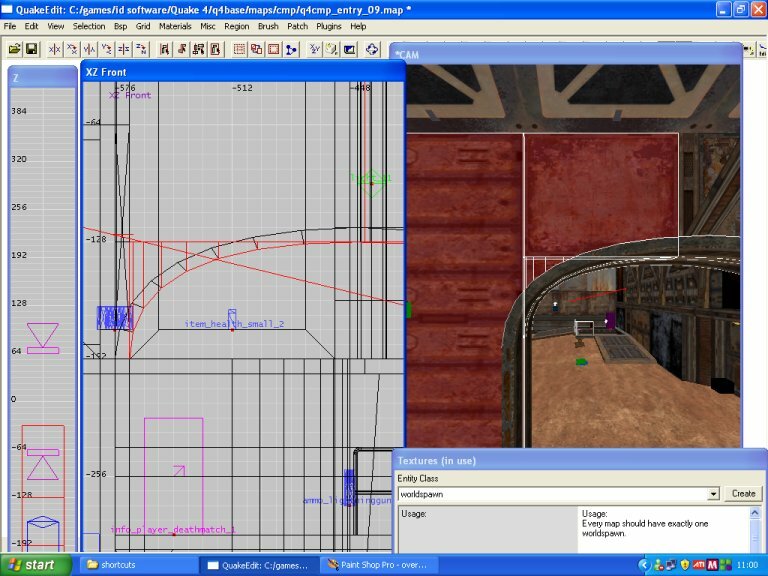 As a result new level designers have been vouchsafed the ability to create maps without learning the technical aspects of design or even at the most fundamental level, how to properly use the editor. So why is this a problem if dmap is so good at tidying up the mess made by a designer? It could be argued that it isn't. The maps still look and function correctly. The point though is that good practise and solid foundation allows for growth and development. How on earth can the current crop of designers progress and improve when their current level of competence is so low? 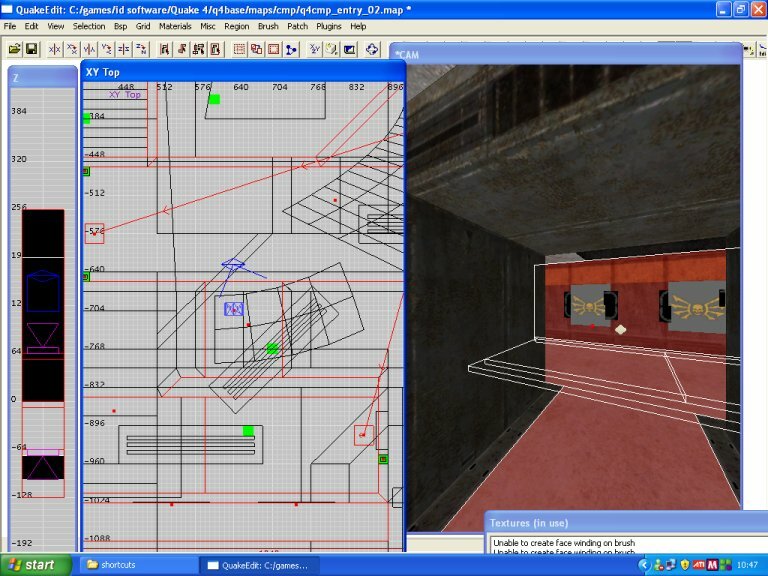 The future of level design is through 3D modelling applications. The majority of designers currently releasing work find it hard to place two brushes together correctly, let alone create anything more complicated. 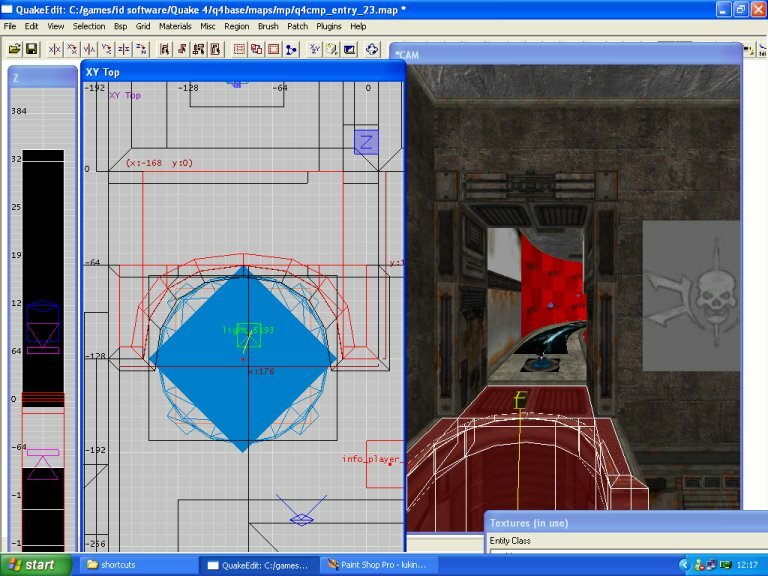 Level designers now use other people's assets, and exploit the available technology to cover over their lack of technical understanding so clearly demonstrated in the work that is produced. Most concerning of all is the fact that in all probability the majority of mistakes are being made in ignorance, both of the errors themselves and the reasons behind them. Enough preaching, time to examining the evidence. 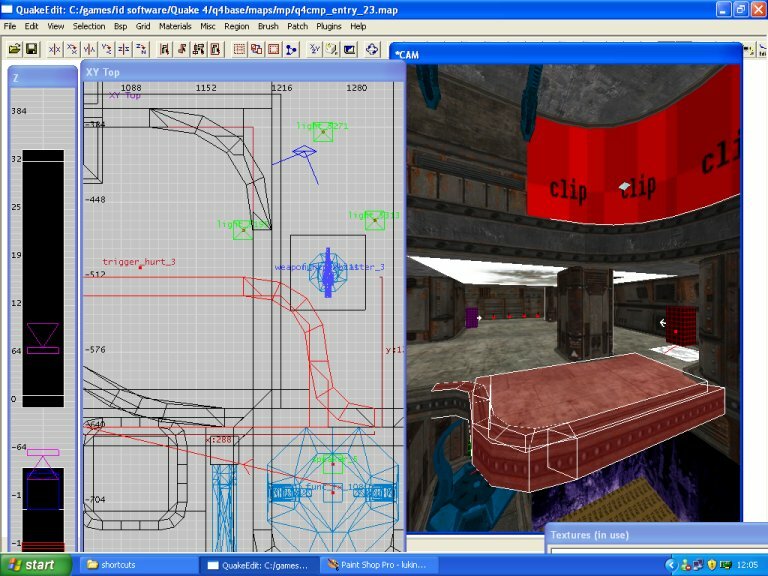 Figure 1 below shows a patch made from player clip, placed on top of another patch. Clip can be used to smooth player movement or to simplify collision. 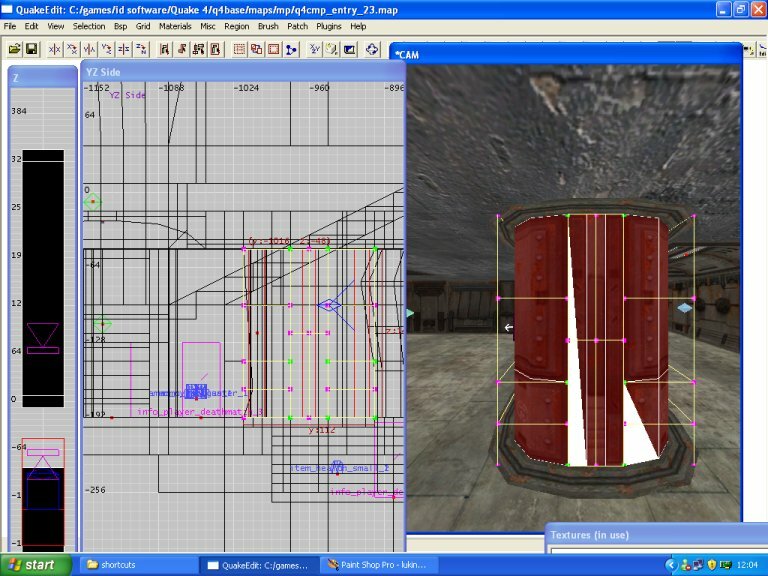 A patch can not be used to simplify collision calculations for another patch. A bevel is already smooth and would not inhibit player movement. If clip were required in this position, shaped brushes would be the correct way to go. Figures 2 and 3 below show examples of poor brushwork technique. There are numerous t-junction errors, where corners of brushes meet the edges of brushes placed next to them, rather than at other corners. This poor construction technique causes the compiler to split brush faces and create more tris. In addition to t-junction errors, note how some of the brushes, although textured pass behind other brushes. As discussed in the introduction, dmap is very good at cleaning up overdraw, but it is not infallible. Relying on the compiler to tidy up poorly made levels is at the end of the day, lazy. Fig 3a presents an example of overdraw in the extreme, where one floor brush is simply placed on top of another. Figures 4 and 5 below demonstrate a shocking use of patchwork. 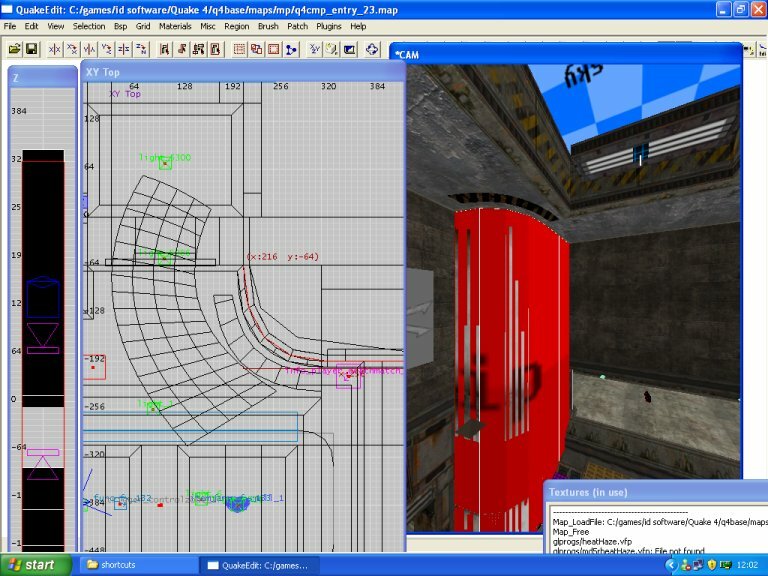 The lack of expertise exhibited in these examples would result in a complete inability to build levels for Quake III. Patches are placed on top of textured brushes, rather than bothering to correctly cut and shape geometry. 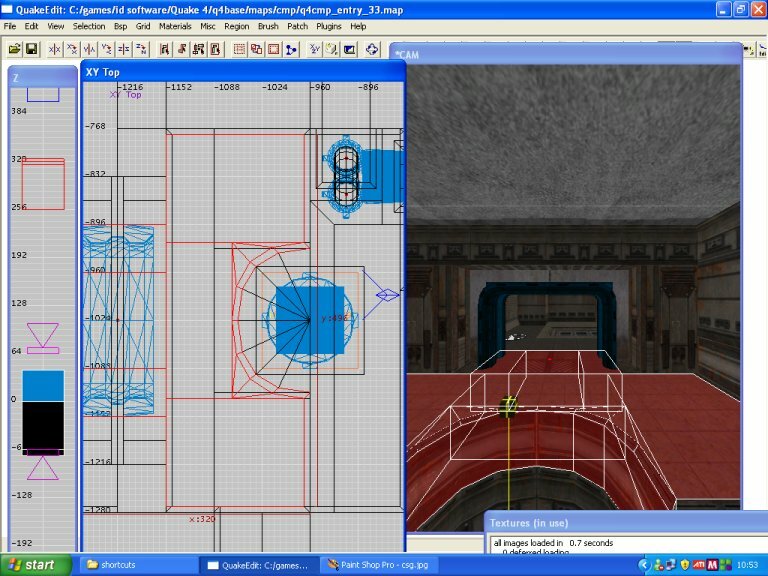 Patches and caps should fit up against brushes, meeting vertex to vertex. Fig 5a shows a much better understanding of how things should be done, although the surrounding brushes should have been mitred where they join. Figure 6 shows incorrectly aligned patchwork. 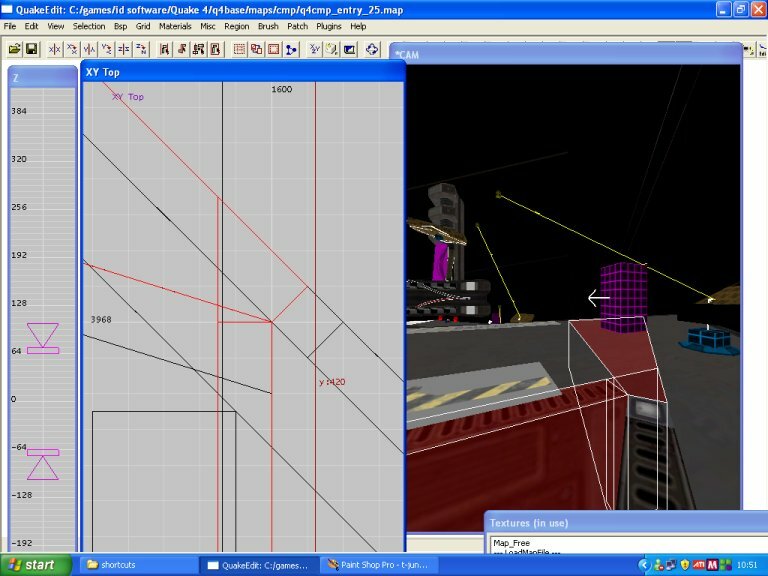 Vertices do not meet vertices. Often the compiler will not fix issues like this and 'sprklies' occur when little holes are formed where the patches meet. Figure 7 below combines most of the building errors that have already been highlighted. Patches have actually been placed on top of a partially visible brush face in order avoid the necessity of correctly aligning them. The example below (figure 8) combines both brush and patch errors. Brushes should have been clipped to meet corner to corner and patch caps used to fit the curves into the geometry. Figure 9 is an interesting one. It appears the CSG subtract tool has been used to cut brushes, rather than the clipper. The result is small brushes with vertices not on the grid. Figure 10 highlights the wrong choice of patch cap for bevels. An inverted end cap has been applied, rather than inverted bevel caps. The problem with using the inverted end cap is that the vertices do not align with surrounding brushes, which could result in sparklies. This is a very basic building error indeed. The above examples are a random sample of the many errors to be found throughout a high proportion of the contest maps. Certain geometry is hard to build absolutely perfectly. In these case, using the technology in such a way as to make it work for the designer is fine. But to abuse the technology through laziness or inability, I personally object to. Use of level wide ambient light sources, as discussed in this article, is indicative of bad mapping, just as is this poor use of the editor itself. Misuse of light and low technical skill are often to be found in the same levels. When a map is considered as to its quality a number of issues should be taken into account. Is it fun? Does it play well? Does it look good? 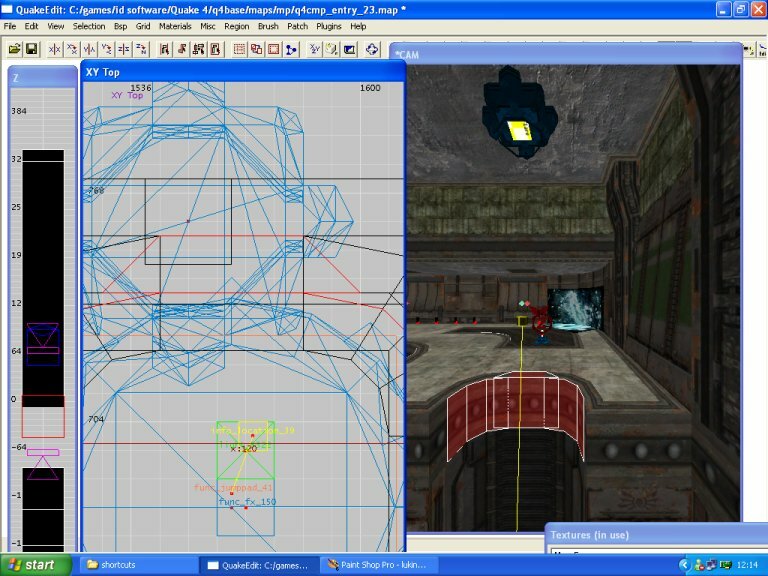 In addition to these factors let me add another, is the level technically good. The days of the craftsman are gone, let us embrace the rise of the brush bodger...or in my case, not.